Social media: The next big thing in research? With the boom of social media platforms such as Twitter, Facebook and Instagram, the use of social media in research has received much attention in recent years. As some of our keen-eyed followers may have noticed, we’ve been using social media to spread the word about a survey as part of the Right People, Right Questions project. Here, I will discuss the benefits and limitations that we have experienced in using social media as a research tool for our project. Social media has allowed us to reach a larger audience conveniently from our office and for almost no cost. In contrast, the more “traditional” means of distributing surveys, such as handing out printed paper copies or sticking up posters incur many monetary and time costs such as printing and travel. The potential cost savings of using social media have been widely noted in other research. Social media has also allowed us to be flexible in adjusting our targeting at short notice. 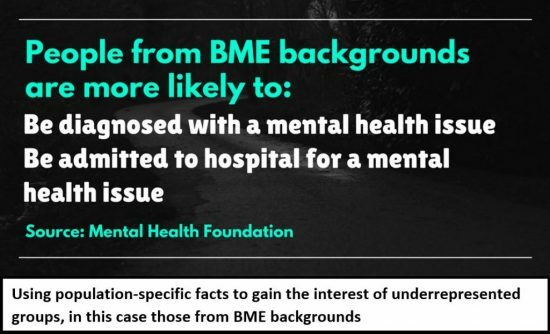 For instance, shortly after launching our survey, we noticed a lack of representation from Scotland Black and Minority Ethnic (BME) groups, those aged 11 – 18, and those from Scotland, Wales and Northern Ireland. Having seen this, we were able to create targeted posts. It is not possible to definitely link the use of social media targeting with an increase in respondents from these groups, but anecdotally the strategy is leading to a rise in responses. We may not have been able to be so flexible with our targeting if we had relied on more traditional means of survey dissemination. Similar strategies have been deployed elsewhere, for example in this study, which saw researchers cater their social media adverts to target African American and Latino groups. However, just being able to create a social media account is not enough. There are millions of social media accounts out there. Why should people listen to us, a new and unheard of social media account? How can our target audience find us amongst all the other accounts out there? Publishing social media posts which are not being read by the people we want to reach wastes time and effort. Accessing ‘gatekeeper’ organisations who have a significant following of groups we want to target has been of major assistance in spreading the word (e.g. by ‘retweeting’) about our survey, an experience shared by other studies. Despite the potential of social media to reach out to potential research participants, it should not be seen as the ultimate remedy for traditional dissemination problems. Social media relies on having access to the internet. Some groups have a lower proportion of internet access, such as those with disabilities and children from poorer households. Furthermore, part of our rationale in using social media is that common knowledge seemed to dictate that “young people” – using a broad definition of the term – use social media. However, when you break down the ages, research shows that up to 99% of young people aged 16 – 24 uses social media on a weekly basis. Meanwhile, of those aged 11 – 15 who have internet access (which in itself is a lower figure than older children), 71% use social media. 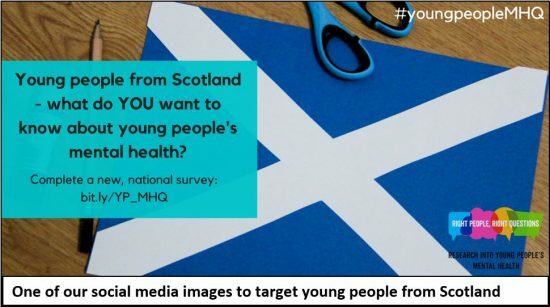 These figures are reflected in our current survey take-up, with an almost 1:3 ratio between the number of 11 – 18 and 19 – 25 year old participants. A similar experience has been found elsewhere. Researchers should, therefore, be wary of conceptualising social media as a magic bullet to recruit young people. Clearly, there are benefits and limitations to the use of social media in research, particularly when reaching out to ‘young people’. The role played by traditional means of dissemination should not be ignored, but combining dissemination methods can increase the diversity of respondents. That’s why we will be additionally visiting schools and other institutions to hand out our survey, or asking those with connections to currently underrepresented groups to do so on our behalf. A careful balance has to be achieved between the potential gains (and costs) of social media versus traditional dissemination, and this balance should be continually monitored to ensure optimal outreach. You can follow the Right People, Right Questions project on Twitter, Facebook and Instagram using @youngpeopleMHQ. You can also use #youngpeopleMHQ to follow the conversation.